Taco Chili Dogs - hot dogs topped with a quick homemade taco chili and cheddar cheese. Hamburger, taco seasoning, tomato sauce, water and Rotel tomatoes. SO good! 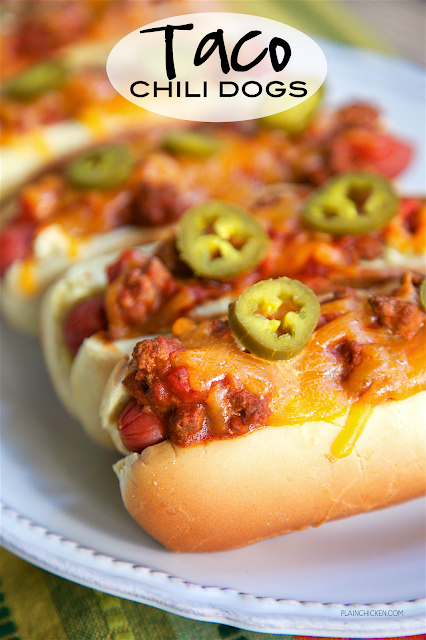 Can make chili ahead of time and reheat when ready to make the Taco Chili Dogs. These were a huge hit in our house! I love the occasional chili dog. 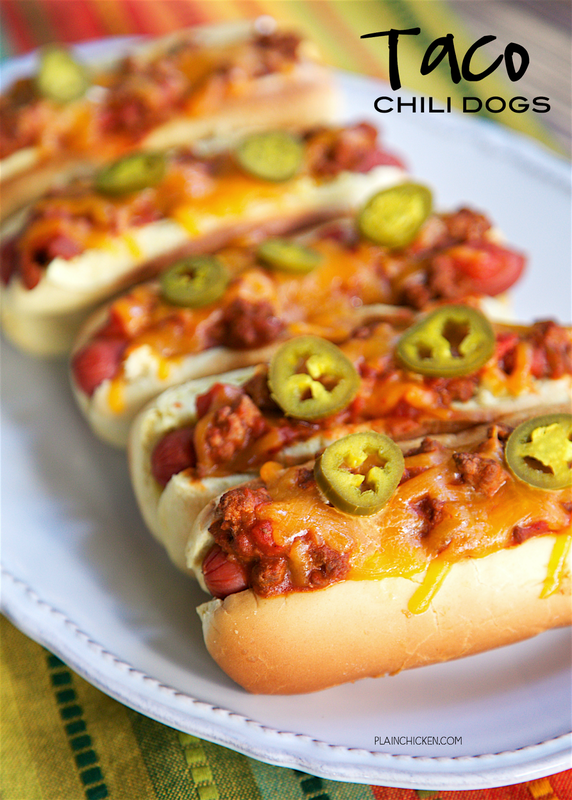 With Cinco de Mayo coming up, I thought it would be fun to whip up some Taco Chili Dogs. I made a quick skillet chili and added taco seasoning and some Rotel. SO good. There was a little kick from the Rotel. If you are worried about the heat, make sure to use mild Rotel in the chili. This is a super quick chili. You can make the taco chili ahead of time and reheat it in the microwave when you are ready to assemble the Taco Chili Dogs. The chili tasted fantastic! It really was the star of the meal. These are kind of messy. Make sure you have some napkins handy!! In a large skillet, cook ground chuck until browned. Drain fat. Stir in tomato sauce, taco seasoning, Rotel and water. Bring to a boil. Cover and reduce heat. Simmer for 25 minutes, stirring occasionally. Place hot dogs in buns. Top with chili, cheese and jalapeños.